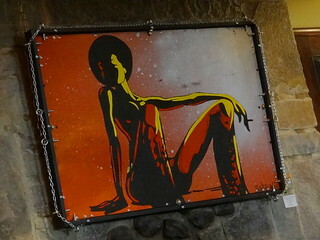 With temperatures firmly in the double digits we leave the confines of the indoors to see what’s happening in Corktown. New businesses are opening at a rapid rate in Detroit, many of them in Detroit’s oldest neighborhood. 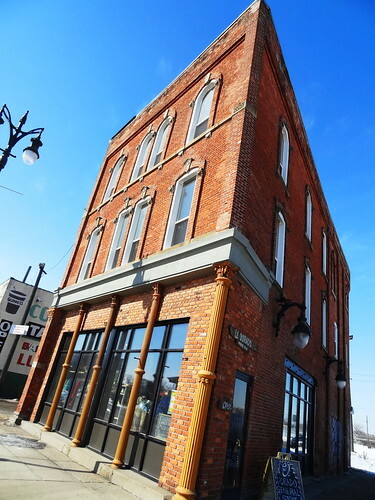 Located west of downtown, Corktown was best known as the home of old Tiger Stadium, many predicted the neighborhood wouldn’t survive the loss of the ball park; the results are quite the opposite. Slow’s Bar B Q was the catalyst followed by Astro, Sugar House, Mudgies, Detroit Institute of Bagels, Motor City Wine, Two James, well, you get the idea….. Historic streets are lined with Victorian era buildings and homes; it’s the hot spot to grab a meal, craft cocktail, beer or a cup of coffee and do a little shopping. Eldorado General Store is tucked into an attractive red brick building on Michigan Ave. A sandwich board out front alerts potential customers of the shops location. 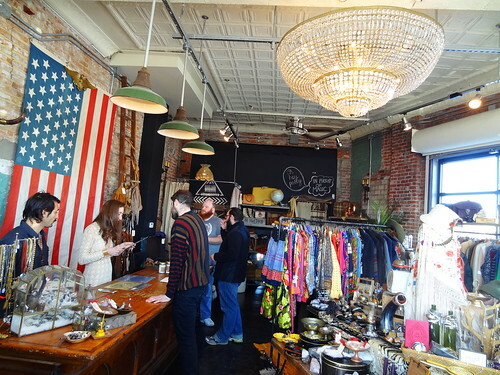 Inside a virtual smorgasbord of vintage goods awaits. A fantastic crystal chandelier clings to the tin ceiling; sunlight sparkles off the facets, a large American flag is draped behind the counter, a deer head mount guards the front door. 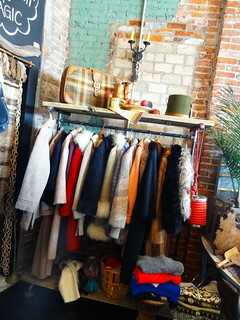 Beautiful clothing, jewelry and accessories are artfully arranged in the space, today there’s a lovely display of fur hats and muffs straight out of an Audrey Hepburn movie. Mod-patterned coffee cups and glass pieces from the 70’s are among the many home goods, trinkets and handcrafted items fill tabletops. 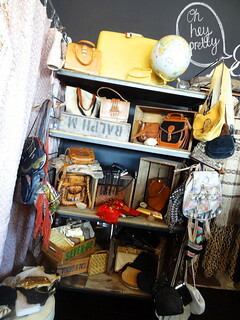 Each time we come the shop is filled with different merchandise—one of the things I love about vintage stores. Owner, Erin is a pleasure to talk with, be sure and say hello when you stop in. 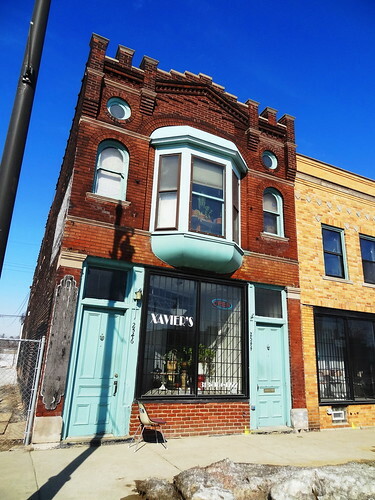 Xavier’s 20th Century Furniture is a bit further down Michigan Ave, we’ve been coming to the shop for many years now and always look forward to seeing his latest finds. 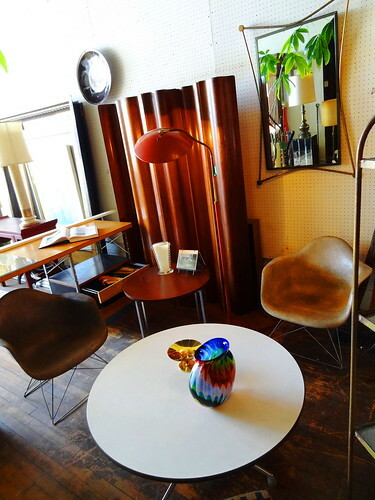 As soon as we step in Kris points out a gorgeous wood room divider along the left wall, a variety of tables, chairs and a desk bear the name of famous designers such as McCobb, Knoll, Eames, Herman Miller and George Nelson. Mid-Century design is as fresh and appealing today as it was then. 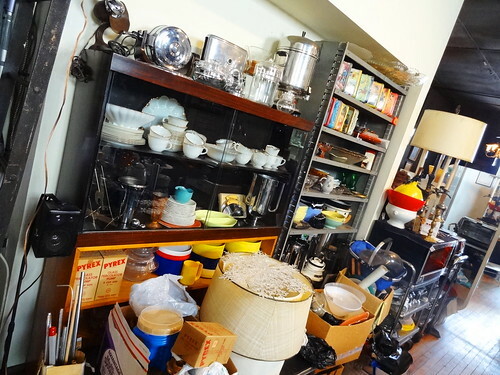 Throughout the shop we see an assortment of pieces from machine-age Art Deco to vintage lunchboxes, American pottery and glassware from Italy and Scandinavia. Coffee servers, tureens, waffle irons and toasters are crowded into the kitchen area, the old glass Pyrex percolator reminds me of my childhood. Nothing we have to bring home today, but there’s always next time! 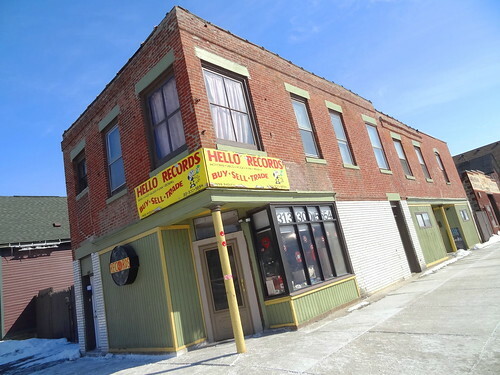 Hello Records occupies a tiny space in a building on the corner of Bagley and Trumbull, it you’re into vinyl, check it out. It’s Saturday and it seems record collectors are out in full force, well-organized bins, boxes, crates and drawers are stuffed with vintage recordings. 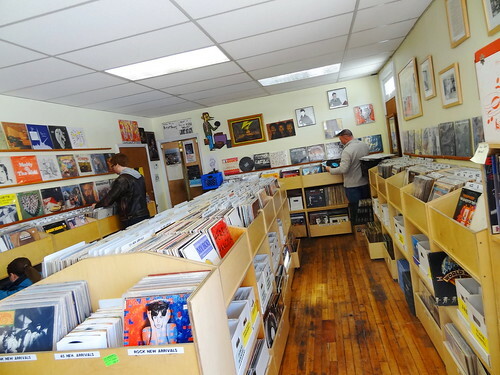 Records spin on the house turntable, tunes from the 60’s and 70’s fill the air as we browse through albums. 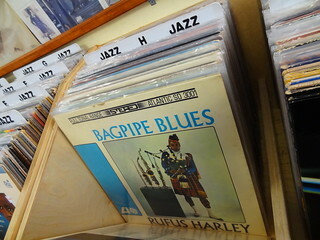 We are not collectors but really enjoy the cover art, album names, and groups we’ve never heard of, Bagpipe Blues anyone? Cool old record cases are available for purchase, great photos cover the walls, the staff is extremely knowledgeable and friendly. 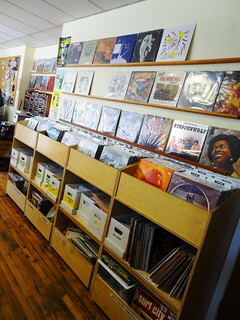 Genres include soul, funk, jazz and rock, new arrivals have a section to themselves. Over in Jazz the cover of Bob James “H” features a hot dog topped with mustard, reminding us it’s time for lunch. St CeCe’s is right across Bagley, we cross the street and duck inside. The former home of Baile Coraigh, all of the beautiful wood paneling, stained glass, lamps and huge stone fireplace remain. 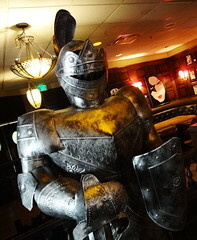 The from-scratch kitchen has developed a loyal following as is evident today by the crowd that fills booths and tables. 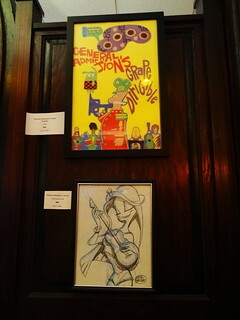 The restaurant features rotating artwork, the pieces currently on display are great. On Tuesday’s guest chefs come in and take over the kitchen, it’s always something new and different. Today we order off the house menu, we get our order in before another big group arrives, there’s something for everyone, meat eaters and vegetarians alike. 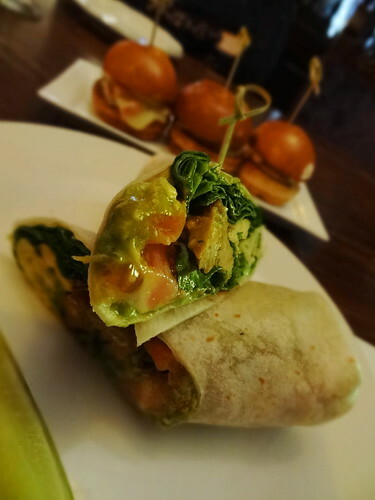 We start with a house salad, a nice variety of greens and a tasty dressing, the Glazed Tempeh Wrap is stuffed with cucumber, carrot, sunflower sprouts, kim chi and cilantro, really tasty. The Shitake Sliders are yummy; shitake mushrooms topped with gooey melted Gruyere and a nice sauce. Since we ate so healthy we decide to treat ourselves to a beer, and we know just the place! 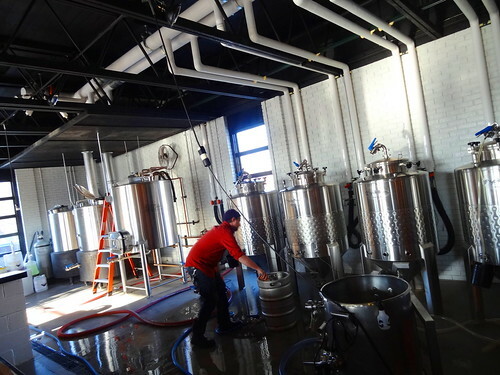 Batch Brewing Company, winner of the 2013 Hatch Detroit contest, opened to rave reviews in February. 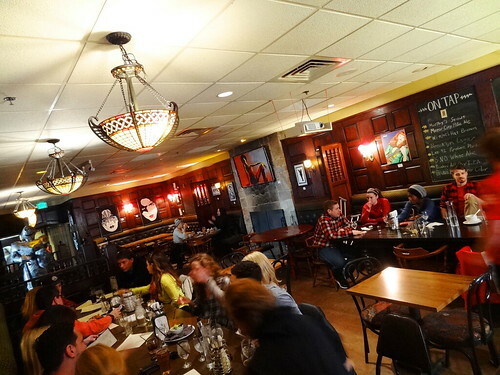 It’s just before 4 pm, we are one of three or four other cars in the parking lot, we reach the door as it is unlocked, communal tables are empty at this early hour, we head straight to the bar. Taking the end two stools we are greeted immediately by one of the owners, we chat a little bit, he asks us what we like, then hands us a couple of samples. 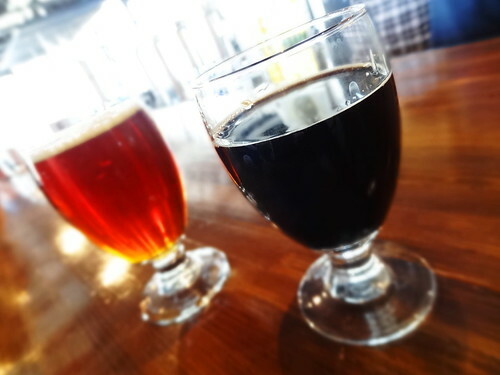 Each is unique, flavorful, refreshing, after little debate we make our selections: Way 2 Biggie (a Barleywine IPA) and the Obscure Reference Imperial Stout. Goblets are filled and slid across to us, though completely different, both are excellent. 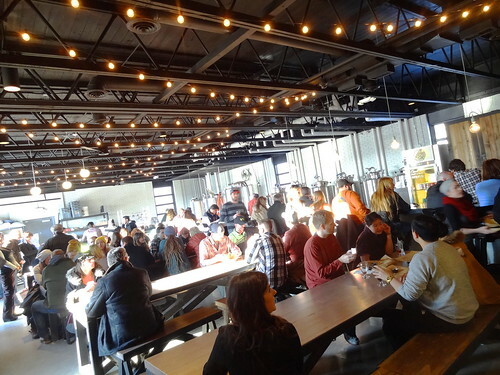 The building has a modern industrial feel to it, it’s a wide open space, strings of clear, round lights follow metal ceiling beams, with picnic table-like seating it almost feels like a patio. Behind the counter, large stainless steel vats contain the small batch brews, chalk boards announce the days selections. Orders are placed up at the bar, we have the best seat in the house, goblets and mason jars are filled with beer, colors range from gold to red to nearly black. Food orders are placed, numbers are handed out and food is brought directly to the customer, everything looks delicious. 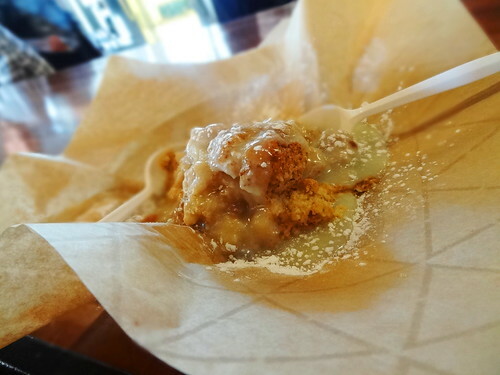 We spy Bread Pudding with Rum sauce on the menu and can’t resist. It arrives steaming hot, moist and smothered in sauce, it’s fantastic! By now the place is near capacity, with no available seating we relinquish ours to a couple standing nearby. Great service, exceptional beer and wonderful food, I can see what all the fuss is about!